2 big bedrooms, 1 bathroom, sleeps 5, sun balcony & private garden, shared pool. 'Villa Sol' is something a little different. 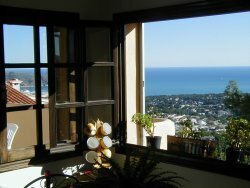 A spacious, secluded, two-storey, hillside villa with breathtaking sea, mountain and vineyard views. South-facing, all day sun. 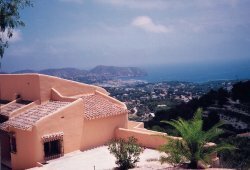 A roomy villa (130m2) in Moraira's exclusive Benimeit area. Sleeps 5, in two large bedrooms and double sofa bed in lounge. The property shares a large pool and is eight minutes from Moraira's fantastic family-friendly beaches, restaurants and marina. 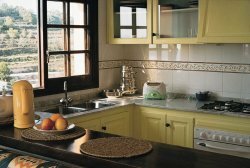 Three minutes from the charming market town of Teulada. 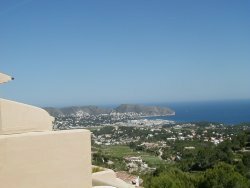 More excellent beaches at Javea, Denia, Calpe and Altea 10-20 minutes away. Large rooms, great views and privacy. While we do rent to smokers, sadly, the commercial insurers insist that smoking only takes place on balcony outsidel ounge and lower terrace garden i.e. no smoking directly inside.